The Inn at the Falls in Bracebridge, Ontario first caught my attention when my husband and I were looking for a place to stay with our two children on a trip to visit Santa’s Village sometime in the late 1980s. A quick search on the Internet yielded a number of lovely places to stay, but what struck me about the Inn at the Falls was that it was supposedly haunted and the owners didn’t try to hide it. I couldn’t resist and booked a room for us. My husband was not as eager as I was to have a paranormal experience while on vacation, so we agreed that I would not book one of the rooms known to be haunted. I was disappointed but knew that the children would also prefer a room with no additional guests. I would have to settle for listening to stories from the staff and hoping for something to happen in the common rooms and hallways. Thankfully, the staff there was happy to talk, and I learned something of the history of the Inn and heard tales of the ghosts that haunt it. 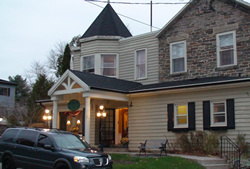 However, it wasn’t until November of 2009 that I fulfilled my dream of investigating the activity at the Inn when we went there with the Haunted Barrie Meetup Group. Before we began the investigation, we had dinner at the Inn and were provided with the history of the property, as well as stories of paranormal happenings reported by staff and guests. English Stonemasons built the Inn at the Falls main residence along the banks of the Muskoka river sometime in the 1870s. Approximately ten years after it was built, William C. Mahaffy, a land surveyor who in 1888 was appointed the first District Judge of the area, bought the property. The main Mahaffy residence was converted into an inn in 1943. The new owners renovated it, though they preserved many of the original features. There is a beautiful parlour that retains the original fireplace. Subsequent owners have bought up surrounding property, and the Inn at the Falls now boasts six other residences in addition to the original Mahaffy residence. One of the items noted from the talk we were given was that there was a fire at the Inn in 1955. The damage from the fire was repaired, and business at the Inn carried on. The Inn at the Falls website names three ghosts who supposedly haunt the premises: Charlie, Sarah, and Bob. According to reports, some believe that Charlie is actually William C. Mahaffy, who, though he did not die on the property, has returned to walk the halls. An article by the Haunted Hamilton group, who did an investigation there, reports that Mahaffy can be seen in the basement inside the “Fox and Hounds” pub, as well as in the hallways that lead to it. (Accessed February 15, 2013). According to various reports, room 105 in the main residence has the most activity of all the rooms. People outside have seen the apparition of a woman in this room peering from the window. There are reports of unexplained impressions on the bed, TV remotes and keys going missing and turning up in room 105, and people feeling as though someone has poked them. Room 106 – a feeling of being watched and the sound of footsteps above though there is nothing above this room. Room 107 – the sound of footsteps above though there is nothing above the room. Most events in the rooms occur during the night or early in the morning. The entryway in the main lobby apparently has a friendly ghost, who greets guests with a cheery “hello” on occasion. We had full run of the main residence at the Inn the night of the investigation. Many in our group experienced something that night, and I was no exception. We had set up an Ouija Board in a small room off the dining room on the main floor. During the session, the video camera shut off for no reason a couple of times, and there was a sound we couldn’t identify. My audio recorder and the video recorder both picked it up. In the parlour, also on the main floor, I felt that there was a presence in the room as we were doing an Electronic Voice Phenomena (EVP) session. When it was my turn to speak, I asked the person to give us a sign to show his presence, as we were going to be concluding shortly and the opportunity to communicate would pass. I received the distinct impression that he didn’t care to communicate with us, and was perturbed by my suggestion. A psychic in the room later told me that she felt that when I made that suggestion, it offended a spirit that was in the room and he didn’t want to communicate. I had not told her what I had felt, so this validated my experience. We also had the opportunity to explore The Fox and Hounds Pub on the lower level after they closed for the night. While we didn’t do any EVP sessions there, it did feel to me as though there was something there I couldn’t see, particularly in the hallway areas. Yes, another investigation where they serve food. As it was with the Old Bank Bistro, we had dinner prior to the investigation in the dining room on the main floor of the main residence at the Inn at the Falls. It was pub fare from The Fox and Hounds Pub, which is located on the lower level. The food was good and hearty, and the service was great. A continental buffet breakfast served in the dining room on the main floor was included in our stay and consisted of homemade muffins, croissants, fresh fruit, yoghurt, cereal, coffee, tea, and juice. This investigation was one of the most active ones that I have participated in, on par with my first experience, at the Cawthra House in Mississauga, though as with all such investigations, it is difficult to prove beyond a doubt which events are paranormal. When my husband and I went to bed in one of the reportedly haunted rooms in the main residence, it was early morning, and we were tired. As I closed my eyes, there was a rattle at the window, perhaps the wind, perhaps not. Someone had told me earlier that there was a ghost named Freddy in this room. Exhausted, I told Freddy to come back in the morning and I went to sleep, happy to be able to stay in a haunted room at last.